You may find of interest the film “Timequest,” as well, which speculates on the premise that, what if JFK and RFK were warned of and actually survived their assassination attempts in quite a magical outcome. Read our review of the film "Timequest"
Listen to this incredible audio recording of a speech made by JFK before the American Newspaper Publishers Association where he warns the press about the secret societies that are the real power in global affairs. 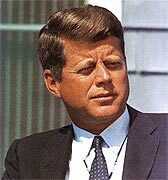 As I have been observing the current Presidential race from a preferred distance, I can't help but notice how the choices they continue to offer up to us to vote for are so far removed from the legacy of the late, great John Fitzgerald Kennedy, arguably our last truly honorable President. For nearly 50 years now, we Americans have had to endure a litany of unfathomably inadequate leaders for such a great nation as ours. Admittedly, George Washington, Thomas Jefferson, John Quincy Adams and Abraham Lincoln set an awfully high standard to live up to. But JFK may have held his own. Which got me thinking about JFK, Jr. I lost my father in 1998. It was a shocking feeling to experience his death at the relatively young age of 67. His age, by the way, not mine. When JFK, Jr. was killed in 1999, I recall feeling an even more uncontrollable sadness that was hard to shake for days, nearly weeks after. I actually remember weeping longer and more deeply for JFK, Jr. than for my father. And I really didn't know why. Certainly, as a child of the '60s, I was always drawn to the so-called "Kennedy mystique." Caroline and John, Jr. were generational contemporaries and I felt a kinship with them throughout my years growing up and even as an adult. They kind of felt like family in a strange way. I am sure I was not alone in this feeling and many people of my generation shared the same kinship with them. The Kennedy's held a special place in our collective hearts. So when I learned of JFK, Jr.'s death, it hit me hard. Really hard. I felt, in some ways, that I had lost a brother. I admired him for what appeared to be a deep seated sense of humility and grace, despite his position of tremendous wealth and privilege. At least, that's the way he presented himself in public. JFK, Jr. genuinely seemed to be wanted to be taken as just a regular guy. Although, with his family lineage and his male model looks, that was wishful thinking on his part. But, at least he appeared to try. Regardless, he seemed to be a man of honor, integrity and quiet strength. His mother groomed him well, I reckon. I think I felt so much sorrow for JFK, Jr.’s death at the time because it seemed like such a deep, heart-felt loss for our country. My father's death was one that seemed to be almost a relief as he was rather ill with cancer. But JFK, Jr. was a man who may have had his best years ahead of him and, perhaps, the powers that be knew that all too well. Time travel anyone? From several reliable sources it has come to light that JFK, Jr. intended to use his "George" magazine to release explosive information that would have blown the lid off the cover-up of his father's murder. He also had wanted to run for the vacant Senate seat in the state of New York until Hillary Clinton got wind of it and blew her stack when he announced this to her. JFK, Jr. then made the brave, and some might argue, the outrageous and foolhardy decision to bypass the Senate seat and jump straight into the Presidential race for 2000. Two weeks later, his plane went down over Martha's Vineyard and he was gone in a flash. I don't think that was a coincidence. Do you? Anybody in America with half a brain, that has some recollection of his father’s murder, knows deep within their heart that the so-called "official" story holds no truth whatsoever. In fact, it is an insult. I still find it remarkable that JFK, Sr.'s death has never really caused the firestorm of outrage one might have expected with such a flimsy cover-up story. At least, not an outrage that we have been made aware of. Former Watergate henchman, E. Howard Hunt, apparently confessed on his death bed to his son recently, that he was part of the plot to kill Kennedy. In his book, "The Elite Serial Killers," author, Robert Gaylon Ross, names all the perpetrators including Lyndon Banes Johnson, J. Edgar Hoover, Clint Murchison, the Rothschild clan, and Richard Nixon, among many, many others. As a nation, and as a people, we have never recovered from that faithful day of November 22, 1963. We took a gigantic, proverbial left turn and we have been heading towards the precipice of disaster ever since. Or, perhaps not. I will dwell on that thought in a minute. Just imagine if JFK, Jr had somehow been able to gain the Democratic nomination in 2000? Surely, if he had been able to accomplish that, he could have easily defeated George W. Bush if the voting public had been given even a remotely honest election. Undoubtedly, he would have been an infinitely more popular candidate than Albert Gore, Jr. was at the time. As it was, Bush couldn't even beat Al Gore without some ridiculous stunt that involved “hanging chads” to steal that election. And JFK, Jr., despite his utter lack of political experience, could have fared much better with the voters due to his personal reputation and that of his father, mother and uncle, Robert. 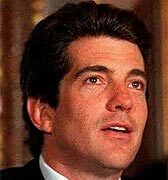 Then, once in office, what if JFK, Jr would have opened a real and thorough investigation into his father's murder? Who knows what would have happened then. But alas, that is just a dream for now. Ultimately, we must trust in the Divine process. There has to be a reason why Bush, Jr. has been allowed to stay in office this long despite his blatant counter agenda for the good of America people. There must be a reason why JFK, Jr. had to die. There has got to be a Divine plan in place. And we must remain hopeful that it is all leading to a tremendous outcome for our nation and our citizens and our planet. I am confident of this. Now, referring to that precipice I was mentioning earlier. Admittedly, George Bush, Jr. may have actually done more to raise awareness of the level of corruption, skullduggery and darkness that has existed in the American government for far too long, particularly since the JFK era. Perhaps, just maybe, this is the wake-up call that that this nation has truly needed to prepare for something greater. I take comfort in the belief that all is in Divine order and eventually, the light shall prevail. But I still do admire JFK, Sr., Jr. and RFK to this day. They seemed to be men of honor, for the most part. They weren't perfect, they had their individual flaws, but I enormously respect what they tried to do. The utter proof of their good intentions lies in the fact that they all paid the ultimate price for it. Their lives. The next Presidential election will be 2012. It promises to be the most intense, the most interesting and the most revolutionary one this country has ever faced. Ultimately, all of this political, social and economic machinations are going to prove inconsequential. Mankind is preparing to make the greatest transformations and transmutations ever to have been experienced on Planet Earth. It may be as little as four years away or sooner. Regardless, it is well underway right now. The most important steps that you can take at this time is to open your heart, open your mind and allow the Divine inspiration that is within all of us, to enter into your consciousness. And begin to realize there is no out there, there is only "in there" and we are all one. Our emancipation as a species, and as a beings, is at hand and the future is extremely bright and promising. Golden, you might say. Beyond the human imagination and the mere words I can write here. Personally, for myself, that is what I am really looking forward to.